Rei Shito is the coolest of the it-girls I know. It girl? Garance!!! The forbidden word?! Well yeah. I dunno. With her, I think it’s cool for some reason. And I mean, she’s just so it-girl. She’s a streetstyle photographer with an amazing style that only works on her and she just came out with a book about the best places to go in Tokyo (unfortunately, it’s only in Japanese right now) and she has huge fans everywhere she goes. And she’s such a sweetheart, simple as that. 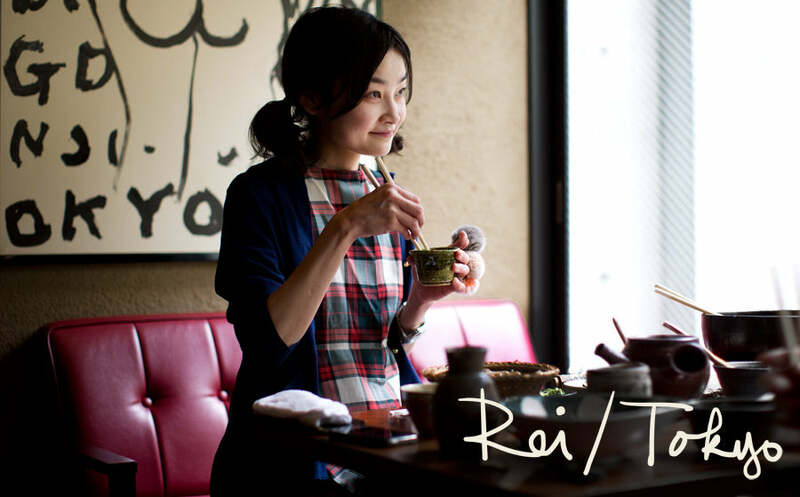 So here are some of Rei’s favorite places in Tokyo. Because, well, I don’t know if I’ve said it enough already : You have to go to Tokyo!!! How would you describe Tokyo to someone who has never been? Tokyo is a platform for culture and history. I think the most interesting thing about Tokyo is the mixture of new and old, western and eastern, famous and up and coming. There is always something interesting happening. Where is the best place to grab a coffee and people watch? Harajuku! I especially recommend Omotesando Koffee. Tuesday is the best day to people watch because it is the day off for the Tokyo Hair Salon. There are so many fashionable employees in the hair salons in Harajuku. What is the one food you have to try in Tokyo and where is the best place to have it? I recommend traditional Japanese food, Kyoto-food. The arrangement is so beautiful and the taste is so elegant. My favorite Kyoto-food restaurant is Kyo-Shizuku at Evisu. It is located on a quiet residential area, so it is a little bit hard to find. The restaurant is popular with people in the know. Aoyama, Harajuku and Shibuya are good. Harajuku and Shibuya are popular with young fashion kids, you can see more fun fashion in this area. Aoyama is more of an adult area, there are some really fine shops like Super A Market, Comme des Garcons, Sacai, Miu Miu, Dries Van Noten and so on. You can see more stylish fashion in this area. What is the best way to get around the city– subway, bike, car? Bike, bike, bike! I always take a bike! Garance, when you come to Tokyo again, I’ll lend you my bike! Is there a really cool fashion item that you can buy only in your city? There are many local Japanese designers with unique and original creations that are only in Japan, like Anrearage. You can also check out Aquvil shop, they have fun items you can only get in Tokyo, with two shops at Daikanyama and Harajuku. If you like vintage shopping, I recommend Lucy at Harajuku and Desperate Living at Shibuya. For popular Japanese designers, I recommend The Contemporary Fix at Aoyama and Garden at Shibuya. These two shops are only for men and the buyer of these shops has a great knowledge of the Tokyo fashion scene. For cooooool tights and socks, go to Avantgarde at Harajuku. If you want to change you hair, I recommend Shima Harajuku–my favorite hair salon!! It is so popular with Tokyo fashion people. There are so many favorite shops, I can’t write them all! Where do you go for a manicure? Uka nail salon at Roppongi! There are big windows in front of comfortable chairs so you can enjoy the Tokyo sights during your manicure. I recommend the uka nail oil too! What is the best souvenir to bring back from Tokyo? If you like Tokyo street fashion, I recommend my first book, Style From Tokyo. It shows Tokyo fashion people and tells their story in both English and Japanese. Hana Celeb tissues are the softest tissues in the world! You will be impressed with it when you try it and when it started to sell in Japan, many stores ran out immediately. I recommend the pocket tissues, they are light and compact so it is good for a souvenir. You can buy it at the supermarket or drug store. Where do you go for a good lunch with girlfriends? Nid Cafe at Aoyama. It is located on the third floor of an old building and it is a little hard to find. This is my favorite cafe for its cozy rooms and yummy dishes. You can see the Tokyo Tower, a symbol of the city, through the window. And a date with your boyfriend ? Super A Market Bar & Grill. I recommend the salad with Chèvre cheese. The restaurant is set up as an annex to the shop Super A Market, so you can enjoy shopping after or before! What is your favorite place for karaoke ? There are so many Karaoke shops in Tokyo, you can do it wherever, whenever you want. Lovenet at Roppongi is fun because there is a variety of rooms. One room has a slide and a swing, like a park and another has a jacuzzi–amazing! What is the cool club to go to? Trump Room, it is located in Shibuya and is known for Tokyo fashion kids. Many of my friends have had crazy parties here. For a more stylist spot, Le Baron de Paris, located at Aoyama. Where do you go to escape the busyness of the city? Daikanyama Tsutaya Books is the new cultural space in Daikanyama. This cool space is the first opportunity for the area to change and be more attractive. What is the one place everyone must visit their first time in Tokyo? The Japanese temple Senso-ji at Asakusa. How would you describe a perfect day in Tokyo? Its a sunny day and I wake up late and go have a delicious lunch with friends. Go to Harajuku and take a street snap (I really love street shooting!). After sunset, I would go to hot yoga and then to my favorite cafe with a book and enjoy a glass of white wine. Then I’d call my boyfriend and go back home and make dinner with him. Perfect! Etiquette is so important, it has been taught by our parents from when were just children. You should say ‘Itadaki-masu’ with your palms together before you have breakfast, lunch or dinner. ‘Itadaki-masu’ means thanks for three contents: thanks for the meals you eat, thanks for the people who make your dish, thanks for the people you eat with. After the meal you should say “Gochisou same deshita’ with your palms together. It means ‘thank you for delicious food.’ I was taught it by my mom so I always say them when I’m in Paris, NY, Milan and so on. When you enter a traditional Japanese house, you have to take off your shoes at the entrance. You leave your shoes there and wear slippers. If you are in a tatami room, you don’t wear any slippers, only socks or tights. When you take an escalator, you should keep left, the right side is for people in a hurry. But this is only in eastern Japan, so if you go to western Japan, like Osaka or Kyoto, you should keep to the right. Ah mais oui ! Je l’ai déjà aperçue plusieurs fois pendant les Fashion Week ! J’adore ses photos et j’aimerais lire son livre et voir ce qu’elle a à nous proposer. I just love the way japanese girls dress, in particular the functional/boyish style which Rei seems to harbour in the photo, with plaid and navy and slouchy silhouettes. I need to relocate to Tokyo. What a lovely portrait of a japanese personality. Thanks Garance. You found your Japanese homologue then! I really don’t like to use the “it girl” word neither, but let’s call a cat, a cat! I love your style, and hers… I love her photos, almost as much as I love the way you see things through your lens… And, oh my god, oh my god, oh my god, I LOVE HER FURY RINGS!!!! If you come to London, I would love to introduce you to your homologue here! I know, I know, we have to go to Tokyo! Really hope I’ll get to go in the coming years! Ah ça fait envie. Belle photo, et super style. Encore une fois, un superbe portrait. Lovely post. She is just adorable. Garance, your posts from Japan have caused me to put it on my travel to do list! Only she is able to pull off bunches! Such cool rings too..
I’ve been trying to go to Tokyo since 2010! One day. I would have loved to hear more about the art scene, and life post-Quake…(perhaps a part 2?). Great post. This post arrives in a very busy day. I just close my eyes and dream to be in one of these amazing places. Merci pour cette découverte et ce portrait! Such a great interview. Now I really can’t wait to go to Tokyo. My brother lived there for 2 summers, not sure why I didn’t take advantage of that. YES, it-girl no doubt. I love her. Can’t wait to visit Tokyo (eventually) . Enfin je comprends ces mystérieuses phrases prononcées avant chaque et fin de repas ! je suis allée voir son blog, les hommes sont nettement plus inventifs et moins coincés qu’ici ! Great interview! Tokyo is at the top of my list of places to visit, and I’ll definitely be referring back to her suggestions when I finally get the chance to go. the best souvenir from Tokyo are tissues? hehe, this is a whole new concept for ‘souvenir’!!! I love these City guides!! thank you, Garance! est-ce que elle a un blog? Beautiful trip in Tokyo, love City Guides sections !!! xoxo where will be the next place? Brasil, India ?? Article super interessant comme tous les autres :) Pourrais-tu nous en faire un sur Londres? This is great as I just moved here, but do you have the addresses for Lucy or Desperate Living? I tried Googling them, but I suspect you have to search for them in Japanese. Thanks for the great read. I love taking pictures of Rei during fashion week..she is so sweet! I enjoyed reading about who she is and what she does. You are always so insightful. TX! Own! He is so cute! Reading this post I want to travel to Tokyo and to meet her. I love japanese people. Excellent! Rei is sooo cool. Cute and quirky and very creative. Not your run-off-the-mill brand-advertisement-it-girl. she has her own style. So going to use these recommendations for the next trip to Tokyo! She is so darling and chic! What a lovely post, Garance! Comme Marine ci-dessus, un City Guide sur Londres s’il te plait!! Thank you for this interview, Garance. I’ve always loved her style since discovering her from Scott’s site, and it’s really fantastic to know more about her. Elegant and sophisticated young woman with good taste. One can see that she lives in the east. People living on the native land have fine line – national colour, originality. When people emigrate, they lose it. It is evident that the girl from the east. She is very special, fragile and cute persona. Bon alors on n’a plus qu’à partir !!!! Merci pour les filons ! Wow, she’s extremely knowledgeable – but that’s what you’d expect from a native, I guess! I always find it interesting how some cultures reverse certain things – like here in Toronto, you keep to the right on the escalator and the left is for people in a hurry. Makes me wonder where they switch around those norms. J’ai vraiment aimé cet article, de très bons conseils! Génial, cet interview! Tes interviews voyage ont un effet fantastique sur… Mon petit business… Pourquoi? Mais, c’est évident! Il s’agit de progresser au plus vite, pour aller exporter partout dans le monde, et surtout au Japon! Great ideas for travelling ! She seems really nice and chic in a way that only asian women are <3 I think I actually love most of the IT girls you brought to our attention. They seem down to earth, cool and with a personal beautiful style. Bonjour Garance, merci pour ces jolies adresses! Elles me rappellent les trois mois merveilleux que j’ai passé à Tokyo pour y travailler dans la mode, il y a… 15 ans, cela me paraissait tellement exotique! Mais je crois que quelques erreurs se sont glissés dans les noms de quartiers que tu cites… Il s’agit d’Ebisu, et non d’Evisu; quant au temple, il s’agit de celui d’Asakusa et non d’Asukasa. Oui, la prononciation japonaise, on met un certain temps à se faire l’oreille! Merci pour cette échappée belle. She really rocks. The Japanese are always so on top of it. you’ve captured so much of her personality in this photo. she seems lovely. Lovely interview! After reading this I feel like I’ve got a little bit of inside info about what’s hot and where in Tokyo! I really want to go there on my next holiday! This is really a very interesting interview. Just like I whould like to know if I had the posibility to travel to this wonderful, interesting city. Very good work Garance!!! She’s so lovely and KAWAII! Elle a énormément de talent ! I discovered you happen to be blog site via Yahoo and I’ve to say. A Gigantic Thank you quite considerably, I believed that your publish was very enlightening I’ll revisit to find out what extra good information and facts I can recieve right here. It’s hilarious (and very nice in a way) that her recommended souvenir is tissues! I love your posts about Tokyo……When you are in Tokyo go to the Grand Hyatt…the view is amazing. On the way to the hotel there’s the Tahiti cafe for a chai latte:)) yummy If anyone loves architecture: got check out the harbor port in Yokohama…its a materpiece! Petite erreur: ce n’est pas “gochisou same deshita” mais “gochisou samA deshita”. Moi qui suis à la fois tokioïte et parisienne, je ne savais pas qu’il existait autant d’endroits sympa à Tokyo! J’ai hâte de rentrer et de suivre ton “city guide”. I like her! I once took a picture of her, there is something about her, yea, she’s cool. I love these city guides! I love these city guides – some South American city next? These city guides are fantastic! The New York ones made my recent trip loads better than any excursion there before. I’m about to go to London for the first time in a couple weeks, and I’m dying to see what you or your friend would recommend! I’ve tried looking all over, and no one does city guides quite like yours! I love her! since years ago! and I love Tokyo! since years ago! J’adore les bague de Rei, sais-tu d’où elles viennent ? Merci pour tous ce city guides Garance, on se sent une âme de globe-trotteuse! Rei Shito est tellement mignonne et elle a un sourire qui inspire la gentillesse et la douceur! i’m spending 4 days in japan on the way back from europe for my honeymoon so this is definitely going on my to-see list! the thing i find about japan though is the sizing is VERY petite, not usually for western figures. even if you are a size 0-2, if you are tall (i am 170cm), it doesn’t fit because most of the girls are tiny! but it’s still infinitely worth visiting all the shops in harajuku to get a feel of the awesome japanese culture. can’t wait to go back! Tokyo is amazing, a super fun and interesting city, with tons of things to do and places to see. I fell in love with the city, and the people! Omotesando Koffee is really good, try the iced cappuccino. And Tsutaya is beautiful, great place to find inspiration and find amazing international magazines.